How to paint in oils, a break down of the flemish method. and, how to paint anything for that matter! You can learn from the comfort of your own home in front of your computer! No driving to classes, wasting gas! Are you having problems knowing even where to start your painting? How did the artists make the paintings I see in the museums? To paint in oils like the masters, how was it performed? Dear beginner/intermediate, and yes, long time artist. Are you tired of putting out one stroke paintings that resemble the starving artist's club? Or even the 30 minute wet-in-wet public television pieces using a house painting brush? You've got a great skill set, yet your work just doesn't stand out. It just looks like every body elses at the city market or local framers/gallery. Are you ready to step up to the next level? To paint in oils like a professional? To gain the recognition of your hard work ethic, your talents? I've been in your shoes! I've looked at these paintings and said, I can see these are hand made, it is not a photograph, yet they look so real! How was it done. To paint in oils so that the picture looks life like! You won't find the answer in your local art school. They don't have time to teach the old methods. They actually abhor the idea, thinking it is too restrictive to your free thinking. Yet artist's and patrons of the arts are starving for this kind of information and artwork. People love realistic art! I'm not saying modern, abstract art is bad. No way, some of the most thought provoking and intellectually stimulating work are from this genre. But there is a great deal to be said for a fine illustration of the human body in motion, like you see in the Sistine Chapel on the ceilings. Or the painting of a clump of grapes that makes your mouth literally water! They are sooo juicy, and ripe and ready to eat! Is there a system, a process to paint in oils like this? It's in books, but the books are mostly very old, and aren't well illustrated. You would also have to understand the terminology. Yes, our English has changed from even 50 years ago! This then bogs you down, and gets you frustrated so you quit. So do you figure out how to paint in oils like this? It's been around for over 400 years, and was developed by the Flemish Masters. Later the Italians put their spin on it, but essentially it remains the same. Once you see the process, and learn some of the terminology, you won't be bogged down. You'll memorize the process, and it becomes second nature. Like riding a bike. You ride the bike to enjoy the scenery and area's that your travel, you don't think about steering or pedaling (unless your going up hill!). You just don't think about it once you've learned it. The same with this technique. Once learned, you concentrate on the bunch of grapes in front of you, and create the masterpiece that makes your neighbors mouth water when they come into your studio! I'm going to tell you the process of how to paint in oils, and if you need more information, I will expand on each step further within the link below. Step one: Canvas preparation. It needs to be a certain way in order to paint great details! Step two: Drawing your subject onto the canvas. There are a gazillion ways to do this. From direct observation to using a tracing machine, and several in between ways that work just as well. It can be a rough sketch to a very detailed highly and finished work. I explain the differences, and why. Step three: Toning the canvas. This is a step the prepares the canvas for your first underpainting. It's simple, its a starting point, it gets your feet wet (figuratively speaking) with your paint. Step four: An underpainting. Limiting yourself to just one color, and using it like you would for a watercolor painting. You will be utterly amazed at how beautiful this step turns out! Step five: A gray underpainting, the same as above, yet more. Using a full value range, you create the half tones, (the part between shadow and light) that will separate your work from every alla prima, 30 minute wet on wet, one stroke painting you've ever seen. Step six: Your color layer, things are getting really heated up here now! Things are beginning to appear to pop off your canvas the 3d effect is beginning to shine. Step seven: Your finishing layer, where you add your final highlights, and details. The texture of the object you are painting becomes apparent, silver looks like silver, cloth looks like cloth, an apple skin has it's deepest colors yet shines with reflections within the room. Now that's just the painting process. Here are some additional general questions about oil painting that get answered within my lessons for you. Composition, how do you know it's right? what are these wooden "Key" things in the back of my canvas? Come on in! 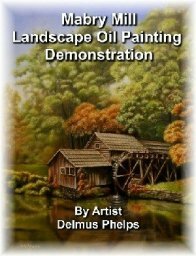 Join us in exploring this wonderful activity of oil painting. Join us in the resurgence of classical painting and how to paint in oils and check out exactly how I create my paintings. For those that want a more comprehensive package of tools, and have never picked up a paint brush before, you may be interested in these DVD's. It's a really big course!